This holiday season we were commissioned by The Art Hotel to use our creativity to design Christmas trees based off of iconic art pieces. To do so we had to step out of the traditional ribbon wrapped Christmas "box" and put on our creative elf hats. Four trees were designed and decorated from inspiration pulled from Andy Warhol, Claes Oldenburg, Roy Lichtenstein, and Van Kirkland. We are excited to share our creations with you, we encourage you to experience it yourself at The Art Hotel, and we hope our art trees inspire you this holiday season. As you walk into The Art Hotel you will see an iridescent white tree with ornaments in primary colors clustered together to create the pop art affect. We then created block ornaments and placed them in-between the large clusters. To complete the tree and the pop art look of Andy Warhol we wrapped boxes with primary colors and placed images of Warhol’s work on the presents. To capture the drama and essence of Claes Oldenburg’s “Big Sweep” we began with a vibrant blue tree and wrapped it with angel hair branches. We then placed clear glass, white, and round branch ornaments on the tree very lightly at the stop and gaining volume at the bottom to create the sweeping motion. To complete the transformation of “Big Sweep” to a Christmas tree we added the broom handle and matching blue dustpan. 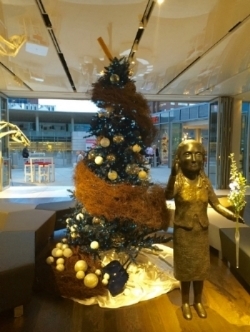 The high impact of “Big Sweep” tree leaves an immediate bold impression as you enter the lobby. Inspired by Roy Lichtenstein and his piece, “Girl with Hair Ribbon,” we created a bold tree for the lounge and restaurant of The Art Hotel. The look was created with ornaments of red, white, yellow, polka dot, and did we mention the lips? To finish the transformation of Lichtenstein’s work into a tree we toped the tree with trailing red, white, and blue ribbon. Perhaps the most traditional looking of the trees we designed was an adaptation of Vance Kirkland’s “Enigma of Opposing Forces.” We used a red tree as the backdrop to a spread of blue, gold, and red ornaments. To complete our painting to tree design we added pops of textured glittered gold ornaments to fully capture the energy of the painting. Big kudos to our hotel designer, Serra Dorozan for her impeccable eye for recognizing and executing solutions!